Several NBA teams – most prominently Philadelphia, Boston, Orlando, Utah, Toronto, and Phoenix – went into the 2013-14 NBA season happy to try out their young players, preserve cap flexibility, and possibly lose a ton of games along the way in order to gain the best shot at the top overall pick in the loaded 2014 NBA draft. They’ve all been conned, however, by the brilliant Milwaukee Bucks front office, one that laughably decided to sign a bunch of middling veterans and hire a retread coach in Larry Drew while pretending to be shooting for another eighth seed in the East. They fooled us all. The Bucks have lost 43 of their first 52 games, and were handed another shot to the arm of their apparently long-unstated goal of earning the worst record in the league this year. The team announced on Friday that forward Larry Sanders, he of the four-year, $44 million contract extension, will miss the next six weeks of the season due to injury. The unyielding snow and cold temperatures may confuse you, but this basically puts Sanders out until mid-spring at minimum, just over a fortnight before the NBA’s regular season ends. 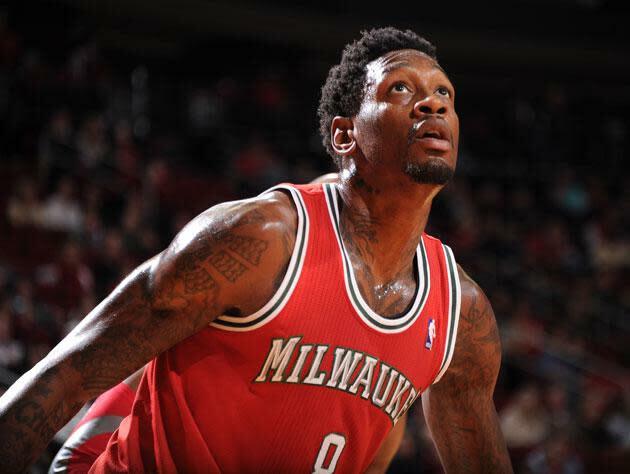 Larry Sanders underwent successful surgery yesterday to repair right orbital bone fractures & will be sidelined for a minimum of six weeks. Sanders, who also Instagrammed his swolle’d up look earlier in the week, is just glad to be out of the hospital. So, sarcasm aside, this really was doomed from the outset, wasn’t it? The Bucks always intended to make the playoffs. The way the team’s ownership and front office sees it, playing to win is part of a public trust, and they’ll be damned if they’re going to pointedly punt a season in order to start over. The problem with that is that this just isn’t how the NBA works, especially if your front office isn’t exactly making the best decisions as you turn over on the fly. This is why the Bucks are bound to end up with some of the best odds in the lottery for the third time in ten years, with only three playoff appearances (and just one winning season) to show for that during that particular span. Think about that. The team keeps adding parts, year after year, in an attempt to make the playoffs. No other team, with the possible exception of the Pacers and Lakers, works this way. Even the Bulls, Heat, Nets, Knicks, Celtics and Spurs have bottomed out. And yet, even in the perpetually miserable Eastern Conference, the Bucks have only managed one winning season since earning the top pick in the 2005 NBA draft. What’s the definition of insanity again? Milwaukee Bucks fans may have been driven to the brink of such mental meltdowns, but they’ve at least kept their wits about them while begging for the front office to take a new approach. What Milwaukee brass doesn’t seem to understand is that teams can play to win while still rebuilding in the same breath. You just don’t have to do it with O.J. Mayo. Nobody is watching the 76ers or Celtics or Jazz and walking away ruing the lack of competitive spirit. These teams are working their tails off, they’re developing young talent that will be around when these squads eventually turn the corner, and they’re also losing at the same time. And, in the case of the 76ers and Celtics, they’re far more entertaining than this year’s Bucks team. It’s actually hard to think of a team that is less entertaining than this year’s Bucks squad, while we’re at it. At least the Pistons have Andre Drummond. The franchise has excuses. Sanders has played in just 23 games this year, some of which while still recovering from a left hand injury, and he’ll only have a few weeks’ worth of work, at best, to round out his 2013-14 campaign. O.J. Mayo, John Henson, Ersan Ilyasova (who has badly tailed off), Caron Butler, Gary Neal, Nate Wolters, Luke Ridnour, and Zaza Pachulia have missed double-figure games this year. Brandon Knight isn’t far off from that mark. That’s nearly the Bucks’ entire roster … but that’s nearly the Bucks’ entire roster! This is the roster that general manager John Hammond put together, while expecting to approximate the 38 wins it needed to earn the right to be swept by the Miami Heat in the first round of the playoffs last season. Most thought he was crazy to assume that a team like this could feature a .500 ceiling. Now we just feel crazy for not anticipating the 9-43 start to the season that this roster has given Milwaukee. If you want to earn the public trust, sometimes it’s best to trust the public. The ages-old adage surmises that if you listen to what the punters tell you, at some point you’ll end up sitting with the punters, and out of a job. In this case, though, the fans are right. Milwaukee should have attempted a proper rebuild several times by now. The double-edged sword here, as the team gets lucky with the terrible record and with Larry Sanders’ most recent unfortunate incident, is that they will be awarded at worst the third pick in this year’s draft, while likely having the best odds at the top pick. The problem with that is that the same owner and (to a shorter extent) front office that has presided over this decade-long mess will now be charged with leading a rebuilding process that they didn’t want in the first place. Inadvertent rebuilding. The Bucks can’t even screw up correctly. Kelly Dwyer is an editor for Ball Don't Lie on Yahoo Sports. Have a tip? Email him at KDonhoops@yahoo.com or follow him on Twitter!